in her walking, she grinds the green grass to power, trees tremble for fear and fall to the ground, leaves fall down and lose their power, birds fail to flee when they heard weapons [nb: a textual crux for which I’ll need a better edition], and the fishes in the water fail to swim. Dry death essentially imagines death only from the perspective of the dying subject, who solipsistically imagines that one’s personal death is the end of all life. It emphasizes formlessness, the end of striving, and the ultimate absence where self once was; death in this model is both absolutely private and absolutely privative. An opposing strain of medieval death poetry—a wet rather than dry imagination—stresses the putrefaction and the appetites that proliferate around the dead. This strain offers fertile ground for thinking through the ecomaterialist appetitive abyss, for it may be the largest body of literature that so thoroughly worries at the inherent edibility of being, that realizes that one’s subjective death occasions new life, and that acknowledges that like it or not, all worldly things are for others in some way. Humans and others may eventually revert to ashes, which is to say, to unrecognizable formlessness, but to get to this point, they must be used up by a one gullet after another, which will be material for the flourishing of others in turn. Put another way, death is only an end for subjects that conceptualize themselves chiefly through pretensions to self-motivated agency. If we know ourselves to be matter, we must recognize our constitutive presence in a world in which we can never be useless. 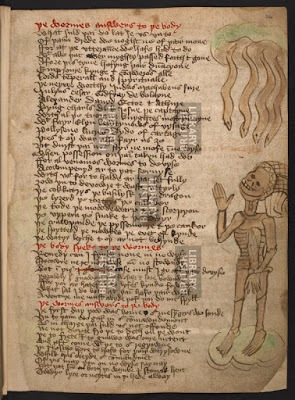 Þe watyr leyche, & oþer ar not behynde. The water leech, and the others are not far behind. The list’s bravura excessiveness promises proliferation without end. At this point Body gives up its efforts to hold onto itself; confronted with so many mouths, it knows itself helpless, food for a host of others, flowing piece by piece into a host of hungry abysses, as it always has, from the moment it entered the world. This entry was posted in MedievalBlog and tagged animals, death, middle english, new materialisms, Worms by medievalkarl. Bookmark the permalink.